The Mexican Hairless Dog (Xoloitzcuintle) is one of the most oldest breed in the world. As follows from the name, its native land is Mexico where breed has been recognized officially in 1956 only. 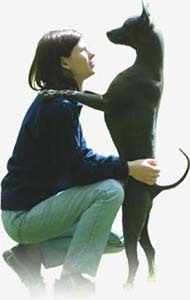 Xoloitzcuintle is included in 5 FCI group "spitz and primitive type", in 6 section "primitive type", without working trial. We are engaged the Xoloitzcuintle since 2003. Our kennel has been officially registered in FCI with the name "Tecuani" in 2005, the certificate № 6792.